Justina Mutale was one of the nominees from around the world who were nominated to represent the Civil Society during the launch of the United Nations International Decade for People of African Descent that took place at the United Nations Headquarters in New York on 10th December 2014. 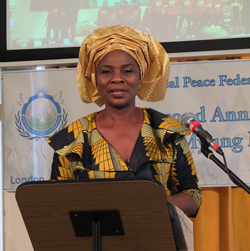 Ms Mutale who is African Woman of the Year and Ambassador for Peace was recommended by the Universal Peace Federation, an NGO in Special Consultative Status with the Economic and Social Council of the United Nations. Dr. Barryl A. Biekman from the Netherlands delivered the Speech on behalf of the Civil Society. The United Nations General Assembly, by its resolution 68/237 of 23 December 2013, proclaimed the International Decade for People of African Descent commencing 1 January 2015 and ending on 31 December 2024, with the theme “People of African descent: recognition, justice and development”. The main objective of the International Decade is to promote respect, protection and fulfilment of all human rights and fundamental freedoms for people of African descent, as recognized in the Universal Declaration of Human Rights.